A new Paladin weapon has been unveiled! It seems that Paladin hasn't given up on hand-buffing. Farraki Battleaxe feels a bit slow and 3 attack at a 5 mana cost isn't exactly ideal. You will also probably be in the middle of your games when you play this, meaning that the Overkill condition won't be that easy to trigger. 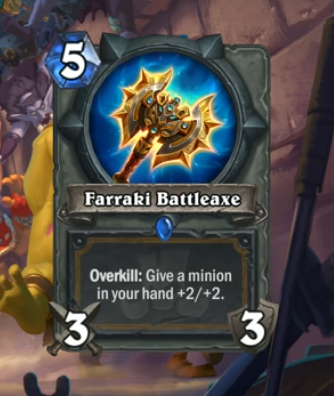 This weapon also doesn't seem to fit with the healing theme Paladin will have in Rastakhan's Rumble. Perhaps it will be more valuable in the Arena.